The Environmental Protection Agency this week issued a final Guidance document directing Appalachian States and the U.S. Army Corps of Engineers to account for saline effluent when they issue Clean Water Act permits to surface mining projects, including so-called mountaintop removal mines. The EPA set the regulatory threshold for salinity “pollution” so low that EPA Administrator Lisa Jackson has said that “no or very few [surface mines] are going to meet this standard.” Obviously, this will have a severe negative impact on the Appalachian coal industry. 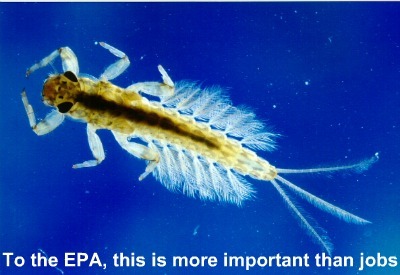 EPA’s justification for the Guidance is to protect a short-lived insect that isn’t an endangered species. Surface coal mining in Appalachia, which is sanctioned by the 1977 Surface Mining Control and Reclamation Act, is loathed by the President’s environmentalist base, but it is essential for the industry’s competitiveness. Since June 2009, the EPA has used precursor documents to the final Guidance to review permitting decisions made by Appalachian States and the U.S. Army Corps of Engineers. These EPA actions effectively created a “permitorium” on new mountaintop mines. On January 13 2011, the EPA went so far as to veto a Clean Water Act permit that had already been issued to Arch Coal for the Spruce No. 1 Mine in Logan County, West Virginia. It was the first time the EPA ever used this authority to veto a Clean Water Act permit that had been issued to a surface coal mine. One day later, a federal district court in Washington, D.C. issued a ruling in which it indicated that the EPA likely violated the Administrative Procedures Act by failing to follow the proper procedural steps before it substantively altered the Clean Water Act permitting regime for surface coal mining projects in Appalachia. The Court is scheduled to take up this matter in October. Job’s are important but so are aquatic insects and they are a key indicator of the quality of the water. It’s important to ballance a healthy environment with a healthy economy, why can’t the water that is a by product of these mines be cleaned up adequately so that the impact of the mines are minimized? This is not an all or nothing question, it’s just the cost of doing business while protecting the environment. The requirements to treat the water, test it, and return it back to the rivers where it will not impact the environment will only create more jobs. Sure it will lower profits but if the mining companies can’t do it right for a profit then don’t do it, our water is too important of a resource to polute! We need to find ballance in these types of issues and talking about bugs the way you do polorizes the issue. Hello Peter, I agree: It’s important to achieve a balance. I don’t think the EPA is doing that. West Virginia Department of Environmental Protection has a number of metrics for water quality. Genus-level species richness is one of many. I’m also suspicious of the EPA’s science. The Agency refuses to base its decision-making on the evidence at hand. What they’ve got is good data that saline effluent from valley fills is inimical to sensitive macrobenthic invertebrates, the mayfly in particular. However, total species richness doesn’t seem to decrease; rather it’s re-arranged. To be sure, EPT abundance and richness is a metric of water quality…but how extensive are the effects? The EPA claims that birds, salamanders, fish, etc. are being harmed by this effluent, despite there being no evidence of this. Does the absence of the mayfly indicate a decrease in water quality? Or does it merely indicate a decrease in mayflies? I haven’t seen any compelling evidence that it’s anything but the latter. And, in the spirit of striking a balance, that’s a trade-off I’m willing to accept. More importantly, it’s a tradeoff that West Virginians overwhelmingly seem to accept, if their representatives in state government accurately reflect their will. Finally, mountaintop removal mining is of course very political. Environmental groups HATE it. With that in mind, it seems to me that the Agency was looking for a reason, any reason, to crackdown on the practice.